Heisman Trophy winner and inspirational speaker Tim Tebow will visit Grace College on Friday, February 16. Tebow will speak at 10:30 a.m. about his career and faith journey during Chapel at the Manahan Orthopaedic Capital Center, 610 Wooster Rd., Winona Lake, Ind. The event is free and open to the public while tickets last. “We are thrilled to welcome Tim to campus and provide our students and community the opportunity to hear from a champion of our faith who has built a very successful career and honored God through it,” said Dr. Bill Katip, president of Grace College. Tim Tebow is a two-time national champion, first-round NFL draft pick, and Heisman trophy winner. He played three years in the NFL for the Denver Broncos, New York Jets and New England Patriots. Tebow is now an outfielder for the New York Mets Organization as he endeavors to succeed at the highest level in two professional sports. Tebow is a college football analyst for the SEC Network and a contributor for ESPN. His 2011 book “Through My Eyes” was named the #1 sports book of the year and best-selling religion book of 2011. In 2016, Tebow released Shaken: Discovering Your True Identity in the Midst of Life’s Storms. 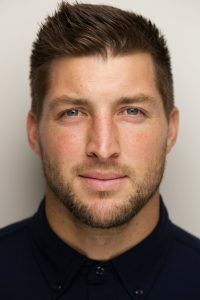 In partnership with the Fellowship of Christian Athletes, which will host Tim Tebow on February 15 for its Night of Hope at the Memorial Coliseum in Fort Wayne, Grace College invited Tebow to speak on campus during its annual Career Week. Throughout the week, the Grace College Center for Career Connections (CCC) provides resources and perspectives for students to help guide the trajectory of their education. An estimated 250 area high school students with disabilities will be in the audience to hear Tebow. These students will be on campus for Transition Exploration Day, an annual event hosted by the Grace College Student Chapter of the Council for Exceptional Children (CEC), to explore local post-secondary options available to them. “We couldn’t ask for a more edifying speaker for this event than Tim Tebow,” said Dr. Cheryl Bremer, sponsor of CEC and associate professor of education at Grace College. The Tim Tebow Foundation is dedicated to making dreams come true for children with special needs including those with disabilities, life-threatening illnesses and those needing a permanent home. The Foundation sponsors Night to Shine, a worldwide prom for people with special needs, which will take place in Warsaw on Feb. 9. Tim Tebow’s visit to Grace College is sponsored by Lippert Components. Generous donations were also made by Wildman Business Group and Dr. Michael Lyons. Tickets are now available at the Grace College Campus Store, located in the Gordon Recreation Center, 100 Publishers Dr., Winona Lake. Campus Store hours are Monday through Friday from 10 a.m. – 6 p.m. and Saturday from Noon – 4 p.m. While tickets are free, they are required for entrance. A limit of six tickets per person will be distributed while they last. For group ticket distribution or for more information, call 574-372-5100, ext. 6106.